Bed Bath & Beyond topped analysts' estimates during the fiscal fourth quarter, but it's still suffering from operating margin and sales growth pressure. Shares of Bed Bath & Beyond (NASDAQ:BBBY), a recognizable and premier home furnishings retailer across the U.S., Canada, Mexico, and Puerto Rico, are rising 5% after the company's fourth quarter managed to top analysts' estimates. Starting from the top, net sales for the fiscal fourth quarter checked in at $3.53 billion, a 3.4% gain over the prior year and just ahead of analysts' calling for an even $3.5 billion. The company's net earnings reached $1.84 per share, which was down from last year's $1.91-per-share result but above consensus estimates calling for $1.77 per share. One of the more telling statistics can be found in the company's comparable store sales. Comparable sales from customer-facing digital channels jumped more than 20% while comparable sales from brick-and-mortar stores declined in the low single digits during the fourth quarter. On one hand, it's good to see its success with e-commerce sales. 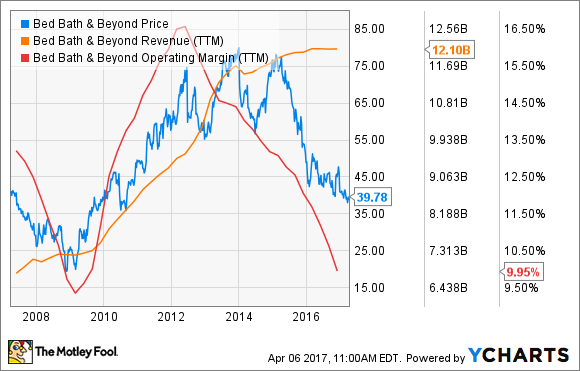 On the other hand, like many retailers, Bed Bath and Beyond is struggling to grow in-store sales and traffic. That's evident in its financial performance, as you can see below. "During fiscal 2016, we made significant investments to evolve our Company and advance our mission to be trusted by our customers as the expert for the home and 'heart-related' life events by continuing to build and deliver a strong foundation of differentiated products, and services and solutions for customers, while driving operational excellence," said CEO Steven H. Temares. Sure, the stock moving 5% higher is a positive development, but investors would be wise to take it with a grain of salt. Bed Bath & Beyond is trading at a price-to-earnings ratio of around 8.4 times, which is cheap enough that any positive news could help push the price higher. The truth, though, is that this marks the fifth consecutive year of slumping operating margin and a struggling revenue growth story. Management has its work cut out to continue to boost e-commerce, lower corporate expenses, and revive brick-and-mortar comparable store sales, but at least today's earnings beat provided some relief to investors.